“My name is Miranda Levingston and I’m from Philadelphia! 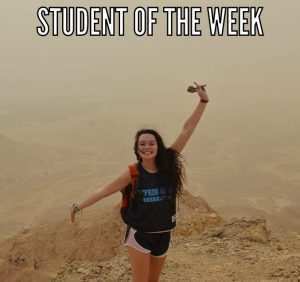 I decided to join Aardvark Israel as I wanted a gap year program that gave me the room to be independent while still having classes and fun group activities with friends. It has taught me countless things such as cooking, Hebrew, how to get around the city, how to wake up to an alarm, how to freestyle and the list goes on. I intern for the Jerusalem Post, the second largest English newspaper in Israel. It’s been a lot of fun and hard work. I’ve learned how to meet deadlines, interview professionals, become a better writer and listen to what the readers want. I’ve exercised my creativity in coming up with new material to write about and I’ve learned from experience that in the journalism world you are only as good as your next article. It’s been so much fun working in a fast paced, creative, and current environment.